When you’re picking out a new pair of glasses, choosing the frames that best fit your face is just the beginning. After selecting your frames, you’ll need to choose the type of lens, lens material, and lens coating. With advances in eyeglass technology, there are several lens coating options to choose from. Talk to your eye care provider to ensure you choose the lens coating that is best for you. If you often experience glare when wearing your glasses, an anti-reflective coating may be a good choice. This lens coating is a microscopically thin layer that prevents light from reflecting off of the front and back surfaces of your lenses. This can dramatically improve vision for night driving and may also make it more comfortable to read or use a computer. 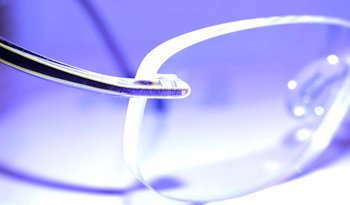 Anti-reflective coating is especially helpful for high-index or polycarbonate lenses, which tend to reflect more light. If you’ve scratched your eyeglass lenses, you know how irritating it can be to look out into the world with sub-optimal vision. Scratch-resistant lenses have a clear coating that prevent minor scratches on the front and back surfaces of the lens. Be aware that even a scratch-resistant coating cannot prevent all scratches or lens damage; however, it can be very helpful in preventing minor wear on your lenses. It is just as important to protect your eyes from ultraviolet light exposure as it is your skin. UV-protective lens treatments block many of the harmful ultraviolet rays from damaging your eyes. This may reduce your risk of retinal damage, cataracts, and other eye problems. Discuss your UV protection in your next optometry exam to determine if ultraviolet light-blocking lens treatment might be appropriate for you. Do you frequently step in from the cold, only to have to wait a few minutes for your lenses to clear before you can see properly? Foggy lenses are a problem in cold climates as well as those with steamy conditions. An anti-fog lens coating eliminates this issue by preventing the lens surface from developing condensation. There are fewer options for anti-fog lenses, because this technology continues to develop. However, an anti-fog coating may be perfect for someone who plays sports or frequently transitions from a cold environment to a warm room. As lens technology continues to advance, more lens coating options may come available. It is always important to discuss your lifestyle and eyeglass lens needs with your eye care provider before making a decision. Choosing a lens coating may significantly improve your visual abilities and quality of life. Buy One Pair of Frames, Get Your Second Pair 15% off.